As a living unit, the cell represents a highly complex organisational architecture that exhibits complicated mechanical and adhesive behaviour. A major challenge for advances in nanomedicine and tissue engineering, is to understand how cells interact with each other and respond mechanically to the biochemical alterations of their microenvironment. Primary aim of the laboratory is to investigate the biomechanical characteristics of single biological cells, such as endothelial, fibroblasts and beta-cells, in a quantitative manner. Specifically we are focusing on the application and development of novel nanomechanical tools that allow structural and functional characterisation, associated with various physiological and pathological phenomena. Our techniques include AFM based single cell force spectroscopy and a tailored nanomechanical tester combined with fluorescence microscopy. In collaboration with biomedical scientists, our ultimate scope is the understanding of the fundamental mechanisms for the development and progression of chronic diseases, such as diabetes mellitus and diabetic nephropathy. Glucose-responsiveness relies on cell-to-cell interactions. Activation of the extracellular calcium-sensing receptor (CaSR) on beta cells increases expression of the adhesion protein epithelial (E)-cadherin. In this study we quantified changes in functional tethering and elasticity in response to the calcimimetic R568. Cell-to-cell adhesion and single cell indentation experiments were performed by AFM single cell force spectroscopy on MIN6 cells. Our study suggest that viscoelastic deformation of cells has a significant influence on the adhesion energy of detachment between adherent cells (FEBS Letters 2014, 588: 1178–1183 and presented at DUK 2014, Liverpool). This work is supported by grants from Leverhulme Trust and Diabetes UK. The aim of this study is to investigate the impact of TGF-β1-mediated EMT in cellular communication through functional cell-to-cell coupling. Under control non-stimulated conditions, control HK2 cells exhibited typical cobblestone morphology consistent with tubular epithelia. Testing was performed above the central region of the cell, which corresponds to the area where the nucleus resides. The pro-fibrotic cytokine TGF-β1 altered the architecture of the cells and produced an elongated, fibroblast-like phenotype, which is a characteristic of TGF-β1 induced tubular damage and ΕΜΤ. 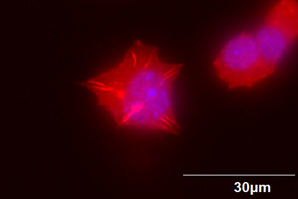 The elongated shape of the treated cells is a sign during the AFM experiments that the transformation occurred. This study investigates how ketamine promotes tissue fibrosis and scarring. A concentration-dependent progression of proximal kidney fibrosis under cytotoxic doses of ketamine was detected using AFM single cell force spectroscopy. Homegeneity of adhesion experiments was assured by using an established model cell line for human epithelial cells of the proximal tubule human kidney cell line (HK2). Localisation and distribution of E-cadherin was assessed by analytical techniques prior to SCFS experiments. Our study shows that ketamine reduces functional tethering between proximal tubule cells and suggests that it is associated with changes in the adherens junction complex. In addition changes in whole cell morphology and CSK re-organisation indicate the interplay between adhesion and mechanics (PLOS one 2013, 8 (8): e71819). AFM with an extended effective displacement range provides the core instrumentation to perform the long distance force spectroscopy experiments, required for this research, with certain modifications of the AFM cantilever. Prior the experiments the cantilever is mounted on specially designed cantilever holder, an optical glass block. The glass block is chemically inert but very susceptible to scratches, since it was polished on its top and bottom surfaces to allow the transmission of light to the objectives. Therefore, the polished surfaces should not be touched with tweezers and can only be used in buffer solutions as well as in low concentration bases and acids. The glass block is locked into the AFM head during force spectroscopy measurements, with the cantilever in a downwards direction. Complementary microscopy facilities are available in the adjacent Microscopy and Analysis Laboratory, run by Martin Davis. This concerns a School of Engineering resource providing advanced imaging services.